Please email gailyn@sopris.net with your inquiries. We are happy to tell you much more about all we have to offer for your vacation or your special event. through the bed & breakfast. We offer cozy accomodations for two, or lodging for your whole family! Our B and B Lodge is located in Carbondale, Colorado, just thirty minutes from the famous Aspen downhill ski slopes and Nordic/cross-country ski slopes in Aspen. 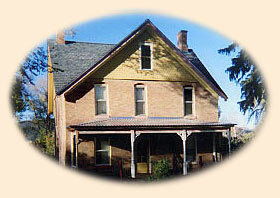 Relax in the comfort of our historic Victorian home, built in 1893. Enjoy our delicious breakfast and warm hospitality. Do you love snow sports and outdoor recreation? This area is well known for premium downhill and cross-country skiing, ice skating, snowshoeing and snowboarding at Vail, Sunlight, Powderhorn, Highlands, Buttermilk, Spring Gulch, Ashcroft and Snowmass ski areas, all nearby. There is something for everyone to enjoy here. Relax in peace and quiet at the house, or explore local activities and adventures including hiking and fishing, rock climbing, golf and tennis. Soak in the healing waters of the historic Glenwood Hot Springs Pool and the ancient Yampah Vapor Caves. Find out more about the area on our Links Page.